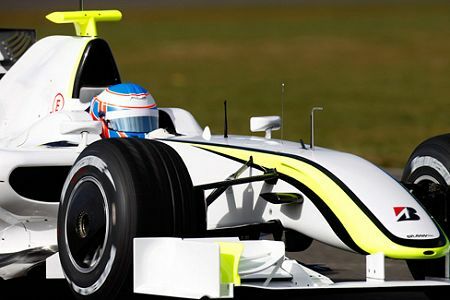 As every F1 site and blog on the net are trumpeting, Honda F1 will now be known as Brawn GP, Button and Barrichello continue as drivers and the team will be in Melbourne for the opening race of the season. With so much info pouring out, I hardly need to comment and, besides, I am a contrary fellow and like to be different from everyone else. So I'm just going to offer the pic underneath for you to make up your own mind on the look of the Brawn BGP 001, as the car is known. Instead, I am going to focus on BMW and Nick Heidfeld - appropriately enough since they headed the times at Jerez yesterday. Testing times are even more unreliable than usual as an indicator of true form but BMW have been a bit lackluster in the tests until now - this is perhaps the first sign that their supporters have nothing to worry about. The BMW Sauber site carries an interview with Nick Heidfeld today and he is quietly enthusiastic about both the tests and the car. The team and Nick are so well matched - restrained optimism and realistic goal-setting are typical of them both. So it is no surprise that Nick's thoughts are measured and careful. Occasionally, however, he says something unusual for these driver interviews. He actually calls testing fun, for instance; you won't hear that from every driver on the grid! "This is good fun as well. It's great when you press the Boost button on the steering wheel and feel the extra shove of 80 horsepower. In testing I also got my first experience of how it feels when another driver presses the button and you don't – you're just left standing." It seems that KERS will be a useful thing to have, particularly in the early races when some of the teams will not have it. That will change as everyone gets their system up and running and it will become more a matter of answering the other guy's button with your own. Then will come the fears for safety as two cars approach a corner at, say, 150 mph and suddenly accelerate to 170. That might mess up the braking distance a little! But these are professionals in the end and I am sure they will cope with it. One just has to wonder if it is really achieving anything at all. "...I'd have to say that my steering wheel was clearer when we still had our own BMW electronics, before the introduction of the standard F1 electronics. Back then we had some clever sub-levels for various functions." F1 steering wheels are complex enough without adding more buttons for KERS and the movable wing. Nick says that the drivers get used to them but there has to be a limit somewhere. Finally, Nick surprises me on the subject of losing weight. His team mate, Robert Kubica, famously increased his competitiveness last year by losing a lot of weight during the off season, but Nick is one of the smallest and lightest drivers on the grid. The fact that he is not going to allow even such a tiny advantage to be given away and has lost two-and-a-half kilos is an illustration of just how fiercely determined Nick is to succeed. I am reinforced in my belief that the Heidfeld/Kubica battle is far from over. Remembering that this car was almost universally condemned as an ugly duckling when it first appeared, can you honestly look at this picture and deny that it is truly beautiful? The F1.09 looks so good at speed and from this angle that I must conclude that my conversion to the 2009 cars is complete - I think they look better than last year's cars and the Beemer is one of the best. Not pretty and racy like the Ferrari F60 or McLaren MP4-24 but seriously purposeful, chunky and almost brutally powerful; quite brawny, in fact. Nick sits in it like a component designed for it, urging it on to even greater speed. I agree that the front wing endplates are too boxy, as though they were girder sections. As the season progresses, however, I think they will become more curved and fit the rest of the car better. The rear wing - I reckon we won't even notice its strangeness by the time the races get to Europe. Profile views can be deceiving. Witness Barbara Streisand! I think Heidfeld could very well surprise this season...provided BMW lets him. I got the feeling that Kubica was slightly favoured last year by the team, although this might be my imagination. Of course you're biased toward BMW. We all know it...and love you for it. Head on the car is ugly and one ugly angle will always outweigh 5 or 6 pleasing apects. I was actually quite surprised by how even-handed BMW appeared to be to their drivers last year. With Kubica showing so well in the first part of the season, it would have been understandable if they had put their entire effort into him. But they persevered with Nick and did their best for both drivers. They are quite McLaren-like in their handling of the drivers or appear so anyway. i have to admit i thought it would take 2 or 3 great races for me to warm up to any of them! my issue was originally with the back wing-which sort of reminded me of a cart oval-track wing (i think that's what they reminded me of ) or maybe just the disproportion to the front wing in the head on photos. but i noticed a month or so back that they stopped looking so odd to me. i think it may have been one of the shots of the rear quarter of the mclaren as it moved away from the camera. the curvature and angle on the sidepod was just gorgeous. i know nothing about aerodynamics so, the asthetics grab me first. what i like about (this shot anyway) the bmw is the whole sweep of the body up down up down back. but i don't like the front wing. it looks like a burro muerto (rio grande valley texian for a cattle catcher on the front of old trains). I though, when Heidfeld was interviewed after Kubica's win, he look displeased and disillusioned as if he'd been treated wrongly in some manner. The manner that they were both brought in to pit during this race didn't seem to sit well with him (Heidfeld)! It was as if they began evening things after this. Vera: Esthetics count for a lot with me too - it's just that everyone has slightly different taste! But this process of accepting the look of new cars happens every year. Things like the relationship of front wing to rear become established in our minds as the "norm" and change can seem radical when we first see its effect. Once all the cars are up and running, memory of the old look fades and the new gradually becomes the expected standard. That front wing and endplates on the Beemer, for instance - when I saw it for the first time, I too thought "blecch!" But it's growing on me. I think it adds to the aggressive and muscular feel of the design, harmonizing with BMWs rather more upright look. Nick: You're right that Nick did not look very happy after the Canadian GP and Kubica's win. But does he ever? I would expect him to be a bit disappointed anyway after his years of hard work with struggling teams and then the rise of BMW fortunes - he may well have felt that the win should have been his. Whether that affected the team's treatment of the two drivers is hard to say. I know that they have always allowed Nick a lot of say in his strategy and pit stop timing but who knows whether Robert enjoyed the same in 2007? Last year there would have been much more confidence in Kubica's ability, particularly after Canada, and he might have been given more say as a result. But they did not give in to his demand that they concentrate on the development of the car - that was Dr Mario's call. I think it is natural that a team should prefer, even unconsciously, a driver they have worked with for years to one who is new to the game. Respect is earned and Robert gained it last year. If the team has become more equal in its treatment of the drivers, that is likely to continue into 2009 and we will see a close battle between the two. It's certainly striking, I'll give you that ! i thought i had seen the worst until this hideous contraption called brawn.it is as white as a toilet bowl with a bit of yellow! they are very optimistic calling their first car 001,how many are they planning?